Our collaborative relationship with MIT Economics has spanned over 5 years. They first approached us when one of their professors won the Nobel Prize and they needed help creating back-end infrastructure, front-end design assets, and social integrations to aid in showcasing the honor. Over the years, this relationship has expanded to included a wide variety of design and development projects, and we’re proud to continue collaborating on innovative projects with MIT Economics. Build and design a scalable web framework which can support high traffic volume while also facilitating the increased sharing of content on social media. A complete redesign and re-architecture of MIT Economics’ web infrastructure, fully optimized for SEO, social sharing, and ready for further expansion in the future. An innovative web experience which supported successful promotion of the Nobel Prize Award as well as best-selling books written by faculty, resulting in steady increases in online traffic and engagement. When one of MIT's Economics professors won the Nobel Prize, the departments existing site wasn’t equipped to showcase the honor. This sparked a discovery and design phase where we created a layout that would enable the department staff to weight news stories and have them display based on time and importance. On top of this challenge, we also developed a new logo and revamped the entire site to give it a modern aesthetic. We incorporated a Twitter feed and links to scholarly mentions in order to make sure the site stayed fresh and didn't get stale. 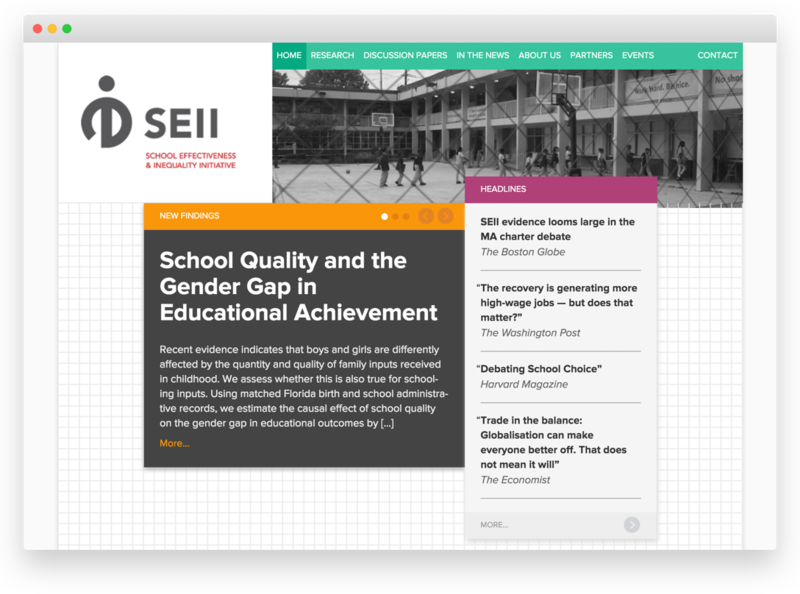 Yeti worked with the MIT Economics department a second time to create the identity and website for their Student Effectiveness and Inequality Initiative (SEII). Our goal was to highlight the great research and press being generated by SEII and with that in mind we took a content-first approach. With the reserved use of color and imagery the research could speak for itself. The result was a clean and modern look to underscore the effectiveness of SEII's work. We have since updated the site to include additional sections to showcase the group’s growing body of work. In response to the website and brand that we created, SEII also contacted us to develop a printed flyer and brochure to further extend their reach. With the upcoming publication of Mastering ‘Metrics (a kung-fu themed econometrics book) Joshua Angrist, a professor in the Economics department at MIT, contacted us to create the illustrations for the book and design a website companion to the book. The goal of the website was to promote the book and provide supplementary exercises and resources for students. We took the opportunity to have a little fun with the material and created an animated homepage that responded to user input from the mouse or a smartphone’s gyroscope when viewed on a mobile device. We also built a customized backend for the website so that exercises and resources could continue to be posted as other economics professors integrated the book into their curricula. After three months Mastering ‘Metrics is still the #1 bestseller in the Econometrics category on Amazon and we’re proud to have worked on the project.